Eamon was interviewed on May 20th on RTE’s The Ray D’Arcy Show. D’Arcy asks Dunphy about the comment that Bono made in reference to the new song, and Dunphy provides some additional background to the story. The remainder of the interview with Dunphy speaks about his work as a biographer for U2 when he spent two years writing his book, The Unforgettable Fire. He was hired by Paul McGuinness for that job, and the book was written prior to The Joshua Tree being finished. Once written he struggled to get anyone interested in the book, but the week after U2 appeared on the cover of Time as “Rock’s Hottest Ticket” he was quickly able to find a publisher. The book went on to sell over a million copies, although it was highly criticized at the time by music journalists. In Boyd’s article for The Irish Times, it is revealed that the new single, “You’re the Best Thing About Me” may not be revealed until next year. Last August, a Norwegian DJ named Kygo played a remix of the song “You’re the Best Thing About Me” at the Cloud Nine festival in Norway. Footage of the song quickly appeared on social media, but Universal Records has had many of these removed. The song had also appeared in short video clips that had been made on the beach outside of Bono’s home earlier that same month. In September 2016, another leak followed from the album followed, this time as Edge’s wife played a new song, believed to be “Love Is All We Have Left” in the background of an Instagram video of a cat. In recent Joshua Tree 2017 tour concerts, U2 has been performing a new song, titled “The Little Things That Give You Away,” often ending the show with the song. An image being shown on the screen at the end of that song which features the Edge’s daughter Sian, and Bono’s son Eli, holding hands and facing the camera. 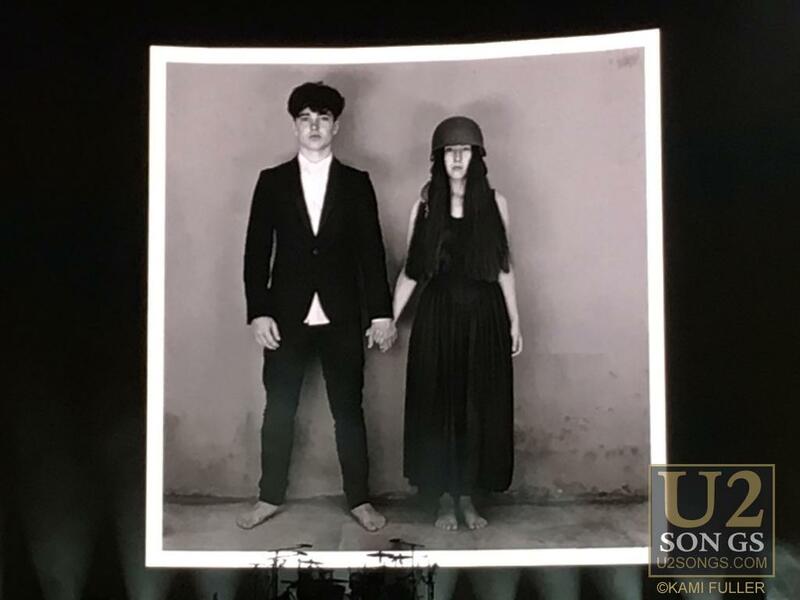 While some sites have theorized that this is the cover of U2’s next album, and we agree this is likely from those sessions, we had originally been told that the cover of the next album would feature two different children of U2 members, and that they would be walking away from the camera. So it remains to be seen if this is the actual cover to Songs of Experience or just a photo from those photo sessions for the cover. Either way, it’s a big hint as to the direction the artwork may take. The photograph is believed to have been taken by Anton Corbijn.